← New wine trend alert: is obscure the new familiar? Last week, a(nother) new wine retailer launched in the UK, this one an online-only venture called Lot 18. They’ve got an intriguing proposition that looks to have some potential, not that it’s showing it yet. Lot 18 launched in America in November 2010, and has been fairly successful there. But America is a winemaking country, and there they mainly offer direct sales – the winery makes the wine, Lot 18 sells it and the winery ships it. Here it looks like they will operate, at least for now, more like a normal wine retailer, albeit a retailer with a tiny selection of overpriced wine. Let’s deal with some positives first. The site looks good – you’ll have to register before you’re allowed to have a good look around, but registration is free and easy – and each wine gets a chunky and lively write-up which is far superior to the two-sentence tasting notes common elsewhere. Chateau Grand Village 2007, one of the more basic wines of their initial offer, got more than 500 words where a typical description on The Wine Society’s website runs to about 40. This kind of attention to detail is the great benefit of having a relatively modest selection. They are also quite proud of their photography, and each bottle of wine gets a gallery of lovingly-shot profiles from a variety of angles. So it’s a decent site to look around, but why should you get actually buy from Lot 18? Good question. I’ve got no idea. It won’t be because of their extensive range: they will only have between six and ten wines available at any given time. it won’t be because they specialise on one winemaking area of interest – the eight wines on sale at launch came from six different countries. And it won’t be because of price, either: their wines will cost between £10 and £90 a bottle, so they’re not going to attract the three-for-a-tenner crowd, but they don’t seem to be doing what’s necessary to attract the more discerning, fat-walleted wine-lover either. They’re not promising to be the cheapest on the market, which is fine – there’s more to life than the search for bargains – but there’s a difference between “not the cheapest” and “a total rip-off”. Though Lot 18 will not be listed on wine-searcher, most people who buy wine at these prices will probably use it, and they won’t like what they find. Lot 18’s launch wines are either otherwise unavailable in the UK (so impossible to check on a like-for-like basis), or more expensive than elsewhere – in one case more than £30 a bottle more expensive. I wrote an extensive wine-by-wine cost analysis, only to find out that Fiona Beckett’s piece, published on The Guardian’s website yesterday, covered pretty much exactly the same ground. Suffice to say that each of their wines come with two prices, one supposedly representing the market rate and another their discounted bargain price, but their sale price was never particularly competitive, and the so-called “retail price” seemed a work of wild invention. Lot 18 say that “our aim is to give our members access to wines in the knowledge that they will represent the highest quality and value”, but they seem at best to be delivering on only half of these two criteria. I don’t want to be mean about Lot 18. Far from it: their UK team took me out to dinner last week, the night before their site went live, and seemed a lovely, enthusiastic, fairly posh bunch (Will Armitage, their general manager (Europe), owns seven racehorses). They gave me some very nice wines, of which one is already on sale – Inglenook Rubicon Estate Blancaneaux 2009, a Rhone-style white blend from Francis Ford Coppola’s winery – which isn’t otherwise available in the UK but they’ve priced at a fairly ambitious £85 for two (though it was excellent). Another, a 2004 Barolo Croera di la Morra from Bruno Giacosa, was properly delicious in a “crikey I have got to get me some of this” way, and is due to go up later this week. I was so bemused by Lot 18’s launch offering that I contacted Will before publishing this post for some clarification. He admitted that they had “misjudged” the prices, but I wasn’t entirely reassured by his explanation for it. “When it came to the price it was a five-minute conversation,” he told me, “but when it came to presentation and photography it had been hours and hours.” They are in need of some serious priority realignment. My real issue isn’t with their prices, however far they veer from the market rate – they are free to choose what to charge, and the customer is free to choose whether to buy. It’s with their crossed-out “retail price”, which appears to have been plucked out of thin air just to make their own look enticing. This seems lazy, dishonest and, in a world where anyone can check rivals’ prices in moments, bizarrely ill-considered. They will hopefully improve: Will said that although they “haven’t been focusing on the price” they will “strive to be competitive on the wines that are available elsewhere” in future. But in the mean time they are making more errors: as I write three of their opening offers have expired and one – the Chateau Grand Village – has apparently sold out, but none has so far been replaced, leaving them with just four wines currently on sale. Edit: one of the four expired offers has re-opened again. I’ll watch with interest in the days and weeks to come as they offer a clearer picture of what they’re about. They intend to hunt down more interesting, small-scale producers, and it may be that in time they become a genuinely intriguing and enticing place to pick from a small selection of well-curated, well-presented wines. Lot 18’s two co-founders were, respectively, CEO of a technology company bought by AOL Time Warner for $360m in 2007, and the founder and CEO of Snooth; Will Armitage joined IG Group as a graduate trainee in 2000 and rose to become head of Europe. They are not idiots. But I think they got their launch very badly wrong, and have come out of it looking so emphatically foolish that it’s pretty hard to conclude that they are not, in fact, fools. I hate being so negative. I’m off to drink away the guilt. EDIT A week later, there are signs of a rapid improvement, at least on the pricing front. At one point they had only two wines on sale, presumably as they battled to clean up their act before launching any new ones, and now things looks considerably better. With the pricing issue apparently corrected, Lot 18 looks a much more viable proposition – it’s just possible that a regularly-updated selection of well-priced, well-chosen and well-presented wines, even though the selection really is tiny, could be a success. The mysteriously-derived “retail price” remains, but the claims are considerably less scandalous than before. Indeed, I’d even go so far as to call them pretty accurate. The current batch of offers, while hardly being fill-yer-boots bargains, are generally a little bit cheaper than the next cheapest merchant, showing encouraging evidence that they have resolved to use a) wine-searcher and b) their brains. They include that Bruno Giacosa brunello for £85 a bottle – it’s available at a handful of other retailers for somewhere between £84 and £100. Rabbit Ranch pinot noir from Central Otago weighs in at £16 a bottle; the best other price I can find is £16.99, while Harrod’s sells it for £25 a bottle (though it’s currently discounted to £21.50 there). Herve Azo’s petit chablis is available elsewhere for £12.99 a bottle, but Lot 18 have it for £11.50. Main Divide sauvignon blanc is sold by Roberson for £12.99 a bottle, and by Lot 18 for £9. Overall, I’ve got to change my position from an emphatic thumbs down to a tentative thumbs up, if they keep up their good work. 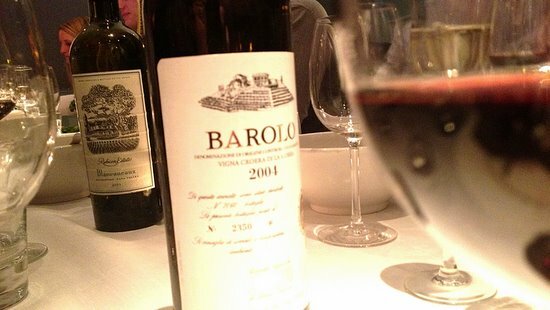 It’s just a shame the Barolo remains so hideously out of my price range – it’s the kind of wine I’d be happy to dig a little deeper for, but in this case I’d have to dig up a goldmine. This entry was posted in Uncategorized and tagged barolo, bruno giacosa, inglenook, Lot 18, online wine retailers, wine retailers. Bookmark the permalink. Hope all is fine. Hate to be picky. I think Bruno Giacosa does not make Brunello. You mean Barlo?